This blog is fed by my creative juices. 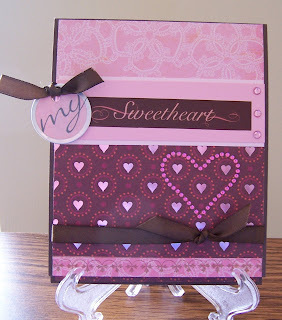 The card base is SU cardstock and the DP is from a Valentine-inspired collection from K&Company. I colored the circle tag with a Copic marker, added some RAK ribbon I received from a friend, and applied rub-on letters (Beach Steel) from Making Memories. The heart-shaped crystal embellishment was a last minute addition to give the card another focal point. 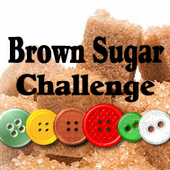 Lastly, the "Sweetheart" title with brown background is also a rub-on and more brown ribbon at the bottom. To give the illusion of a border on the right side of the sentiment, I added three, pink crystals. Thanks for stopping by! I hope you had an enjoyable Valentine's Day with your special someone.